A New, Unique and Innovative Class designed for Kids ! 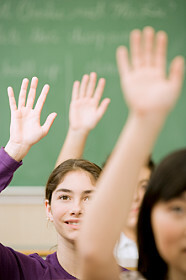 to aid in better academic performance. 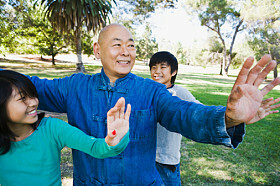 Tai chi practice for Kids is for health and fitness purposes and does not include fighting, nor promote aggressive activities. For those who are interested in martial arts, they may continue their study with our push hands and application classes in future. Based on Kung Fu and Yin Yang philosophy, that promote the art of peace, Balance, internal harmony and physical fitness, this class has been especially designed to provide a full hour of safe and gentle, yet intense work out for the whole body, and the mind. It begins with meditation postures to calm the mind and mildly warm the body. as well as increasing balance and flexibility. 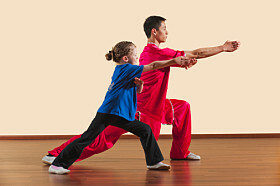 The students will then be introduced to stances and postures and will have the opportunity to practice them individually or in combination to develop coordination. 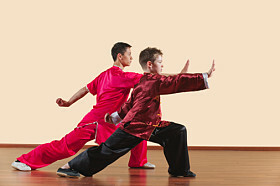 These stances and postures normally carry names and forms that often immitate animals and nature, and are fun to practice. 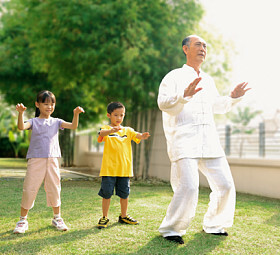 They are also the building blocks that will later be placed in sequence to form the main Tai Chi routine. promote concentration and better memory. and enhance kids' innate vitality.